Bill de Blasio with wife Chirlane and their son Dante. September 4, 2013–It wasn't supposed to happen this way. A year ago, the accepted wisdom was that Christine Quinn would at this point be leading the pack, followed by Bill Thompson. In the runoff, Thompson would attract most of the male and underpolled minority voters, and he would probably win. It is hard to believe today that the Thompson-winning-the-runoff scenario will in fact pan out–now that Public Advocate Bill de Blasio has pierced the crucial 40 percent line in a Quinnipiac poll one week before the primary election. Thompson had a better chance in 2009, when he finished close behind Bloomberg, who arranged a change in NYC law to allow himself to run for a third term. If de Blasio does win more than 40 percent of the primary vote, he would walk to the November election without a runoff. Thompson is running second and Quinn third. The difference between second and third place in the poll is not significant. But the difference between first place (43 percent) and the average of #2 and #3 (19 percent) is highly significant. There is still the unknown of the underpolling of black voters, but a majority of those polled say they prefer de Blasio to Thompson. What should we credit for de Blasio's surge in the polls? 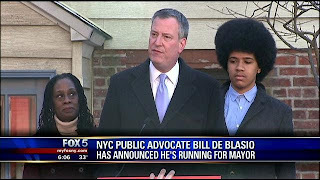 Seriously, one factor is Dante de Blasio's Afro and his warm words about his father in a television ad. He and his mother have pulled votes from Thompson. But the New Republic thinks that de Blasio has picked out a perfect theme for NYC Democratic primary voters, i.e., the issue of inequality. The idealists who led the Decembrist revolt in Russia in 1825 wanted to raise the status and income of the serfs. They failed. The Bolsheviks had a more manageable plan–force the rich farmers into collective farms. Stalin slaughtered the ones who protested. Worked perfectly. The farmers who survived became equally poor. The top 1 percent of earners in NYC accounted for more than one-third of the income reported by NYC residents in 2009–twice the national share. These 34,500 households all earned at least $500,000. Together, they paid 43.2 percent of NYC's income taxes. Progressive taxation of income is alive and well in New York City. At the other extreme, 53 percent of households, those earning less than $30,000, owed no state or city income tax, although anyone working has to pay the Federal payroll tax. It is hard to make the case that the 1 percent in NYC are not paying their "fair share" of NYC income taxes. Digression: The figures would look distinctly different from the Federal perspective, including payroll taxes. The 12.4 percent regressive FICA payroll tax on labor stops being collected at $113,700, though the smaller Medicare tax of 2.9 percent stays and a surtax of 0.9 percent kicks in at $200,000 or $250,000. The basic taxes are paid half by employer and half by employee. Payroll amounts to 85 percent of the income of the bottom 99 percent, vs. 40 percent of the top 1 percent, whose other incomes are on average less rigorously taxed than payroll is (the key point being that there is that $113,700 ceiling on incomes subject to the payroll tax). When I was working at the NYC Comptroller's Office, a political aide to one of the Comptrollers asked me if I could write a report to be used for a speech in which the Comptroller would argue that rich people didn't pay their "fair share" of City taxes. I provided the data showing numbers like the ones above and the project was abandoned. It was picked up again by Liu. The problem is not that a surtax on the rich would make them all leave New York. Only a few of the 34,500 households that make up the top 1 percent would leave. But they would not go gently into that good burb. Once officials in Connecticut, New Jersey or Florida (or Westchester) get wind of such moves, they would actively recruit movers. The departure of 500 households could seem like a mass exodus. Restoring New York City's middle class remains an admirable goal. Taxes are too high on the working poor. But solutions must be sought in an intergovernmental context. When President Clinton imposed a surtax on people earning more than $200,000 a year, there was no moving or squawking about moving because no one could escape the tax except by leaving the United States. If he wins the Democratic primary, Bill de Blasio will need to recalibrate his political antennae to the more conservative electorate of the General Election. Significantly higher taxes on the 1 percent will prompt some people to avoid the higher tax by moving out of NYC–i.e., by selling or giving up their home or office or both. If a lot of people decide to start doing this all at once, it will be bad for NYC real estate and business generally. U.S. DEBT | Debt-Ceiling Chicken Again?